I watched it but was not able to finish it, I stopped. More than the sights of so many dead bodies on the streets (zero trial, zero investigation, zero hearing of the other side, just shoot-kill-obosen), it's the pain and crying of the family members that struck me. Even if I'm not exactly a fan of the NYT. 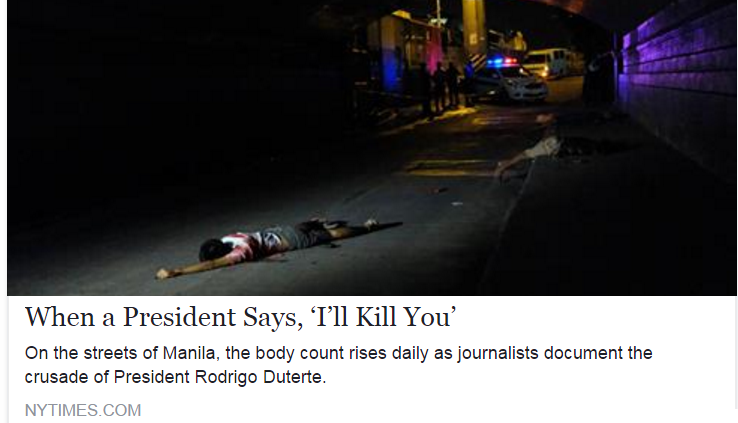 Some people who stood up against Martial Law and succeeding corrupt administrations are now praising this man. They seem to be clapping and applauding the violent "war on drugs". They hate the past administration, which is understandable because no government or admin anywhere in the planet has 100% support from their citizens. But these are two different things. There are no existing laws that say shoot-kill-obosen is the policy. Rather, there should be (a) police investigation, gathering of tight evidence, (b) if evidence is weak, let go of the suspect; if evidence is tight, go for prosecution, (c) wait for imprisonment judgment. These are hardly practiced by the police, little rule of law, only the rule of men, rule of dictatorship. Just shoot-kill-obosen because they are poor suspected drug pushers and users. Different treatment for rich suspected drug criminals. I met a Congressman's staff last November during the EFN Asia conference at Dusit Hotel, Makati City. He said that he used to support the Du30 drugs war, the murder of suspect drug pushers. Plus the fact that his Congressman-boss is a member of the majority party. Then one early morning, while walking near the Ombudsman at Batasan road, he saw an actual murder, the victim fell about 2 meters in front of him, died on the spot, then the gunman pointed the gun at him, waiting if he will make any unnecessary move. The staff froze, nervously, after a few seconds the gunman considered him a non-threat, so he put his gun in his waist, walked casually to a waiting motorcycle as if nothing happened. The staff took a leave from work for 2 weeks, went to a psychiatrist for counselling, and made a U-turn in his position on the violent drugs war. He asked himself, was it a police rubout case? He has 2 reasons for believing it. One, the murder occurred not far from a police station near the Ombudsman and tricycle terminal, but there was no immediate police action. It seemed that suddenly they were sleeping inside or were all out on patrol at that moment. Second, he asked his contact at the PNP HQ, a mid-level officer, if it was a police operation, his contact did not answer. Yes or NO, no answer. Silence is implicit for Yes, otherwise the officer should categorically say No. I asked who his boss is, the Congressman, he did not tell me, only saying that his boss is from Negros island. If this government has to be serious in the "drugs war", it should go through the process. The long process, the legal, judicial process, no shortcuts of summary executions while leaving the influential and rich drug peddlers moving casually. Otherwise, government should legalize and decriminalize drugs use, just regulate these products like what they do in The Netherlands. 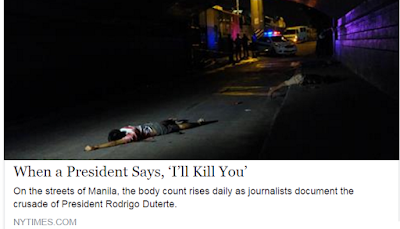 Ahh, the docu shows the pronouncements from PDu30 mouth -- kill, shoot, murder. 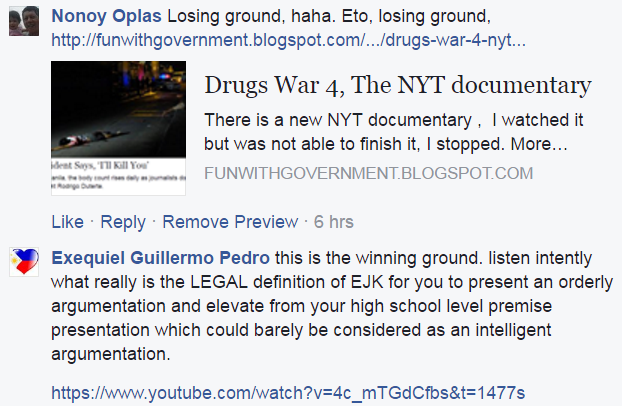 Or perhaps I was hearing it differently... PDu30 was exhorting the people to have patience with suspected drug users and pushers, he was exhorting the police to take the long process of investigation-prosecution-imprisonment taking months or years for drug offensers. 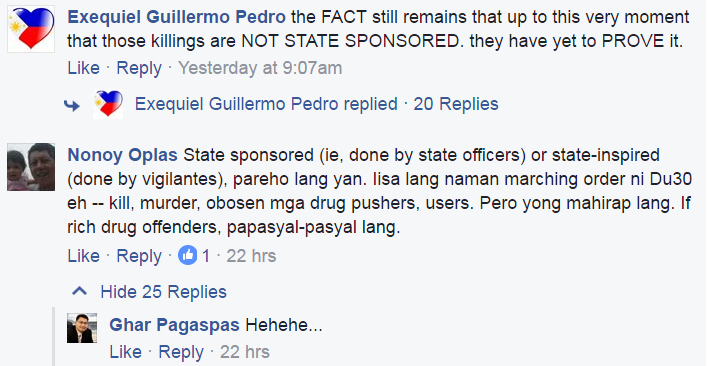 So, there are no EJKs... palusot nga. 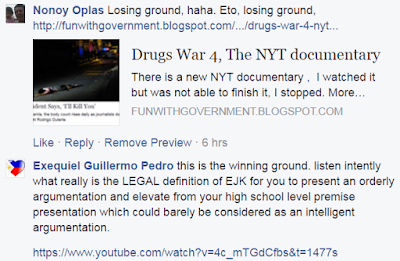 (2) "EJK means people killing each other by the thousands over drugs so that PRRD won't be pressured over his campaign promise to resign if after 3-6 months in his term the drugs problem still persist." These denialists of large-scale state-sponsored or state-inspired murders by the thousands, they are like their idol. The faceless fanatic has employed low life language. Not good to continue the discourse.